Apple, as well as third-party manufacturers, make a variety of accessories that are compatible with iPhone models. Wireless headphones, including Apple AirPods and BeatsX earphones, are designed to work with the new iPhone 7 and 7 Plus, both of which no longer have a 3.5mm headphone jack. In fact, AirPods and BeatsX earphones each feature Apple's own W1 chip for easy pairing and extended battery life. 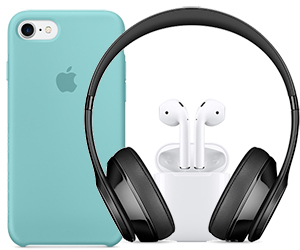 In addition to Bluetooth headphones, users can protect their iPhone devices with special cases and/or charge the smartphones with Lightning docks and cables.